Monsters are on the rise and Gods walk the streets of Ashen Falls in four stories that serve as a prelude to The Eighth God. A young half-elven boy is kidnapped by a children's nursery rhyme. Someone wants to get their hands on The Doves loot, but they have to get past two bouncers to do it. Something is killing residents of Ashen Falls, and a young Melress is found standing next to a body. Can the Battle Mage find the real culprit? It's a foggy night in Ashen Falls, and soon monsters walk the streets led by a man with one thing on his mind - revenge! Entertaining and funny! I previously read The Eighth God, so I had some familiarity with Mr. Lavender's world and the characters. I think it would work fine to start with this collection as well. Tales from Ashen Falls is a quick and enjoyable read. 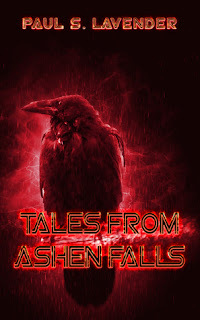 These stories center around a pub in the city Ashen Falls and the unlikely paths that cross within it. The tales connect to each other a bit, each one building on the circumstances and outcomes of the previous. The sparse writing style features cursing and cheeky banter. It's grim, violent, downright nuts, and the characters don't shy away from mocking themselves and their woes.